Synthetic peptide within Human Ki67 aa 1200-1300. The exact sequence is proprietary. IHC-P: Human tonsil and testis tissue. Common marmoset spleen tissue. Rat esophagus, small intestine and liver tissue. Mouse embryonic skin tissue. Transgenic mouse spinal cord tissue. Rat lymph node tissue. ICC/IF: HAP1 cells. Human cardiac stem cells. HEp-2 cells. Rat cardiomyocytes. Flow Cyt: HAP1 cells. Our Abpromise guarantee covers the use of ab16667 in the following tested applications. Antigen retrieval: Boil tissue section in 10mM citrate buffer, pH 6.0 for 10 min followed by cooling at room temperature for 20 min. ab172730, Rabbit monoclonal isotype, is suitable for use as an isotype control with this antibody. IHC-Fr 1/1000. A higher dilution is recommended for frozen tissues than for FFPE tissues. We suggest a starting dilution of 1/500. ab16667 staining Ki67 in wild-type HAP1 cells (top panel) and Ki67 knockout HAP1 cells (bottom panel). The cells were fixed with 100% methanol for 5 minutes, permeabilized with 0.1% Triton X-100 for 5 minutes and then blocked with 1% BSA/10% normal goat serum/0.3M glycine in 0.1% PBS-Tween for 1 hour. The cells were then incubated with ab16667 at 1/250 dilution and ab195889 at 1/250 dilution (shown in pseudo colour red) overnight at +4°C, followed by a further incubation at room temperature for 1 hour with Goat Anti-Rabbit IgG H&L (Alexa Fluor® 488) preadsorbed (ab150081) secondary antibody at 2 μg/ml (shown in green). Nuclear DNA was labelled in blue with DAPI. Proliferating cells (Ki67+, brown) were seen in lymph follicles (presumably B-lymphocytes) and in para-follicular areas (presumably T-lymphocytes) in control-LNs. In AT1-LNs, the para-follicular areas dominated, and contained most of the proliferating cells. In MLL-LNs, the para-follicular regions appeared to contain less proliferating cells than in AT1-LNs. Frozen sections of rat lymph node tissue were stained for Ki67 using ab16667 in immunohistochemical analysis. DAB staining. 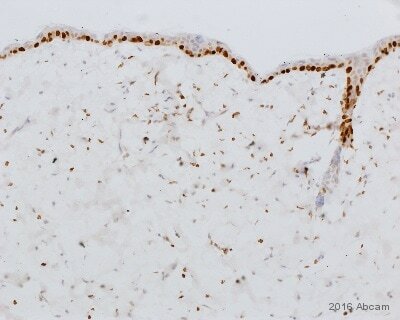 Immunohistochemical analysis of human tonsil tissue labeling Ki-67 with ab16667 at 1/200. The HRP/AEC-staining procedure was used for detection. Overlay histogram showing HAP1 wildtype (green line) and HAP1-MKI67 knockout cells (red line) stained with ab16667. The cells were fixed with 80% methanol (5 min) and then permeabilized with 0.1% PBS-Triton X-100 for 15 min. The cells were then incubated in 1x PBS / 10% normal goat serum to block non-specific protein-protein interactions followed by the antibody (ab16667,1/1000) for 30 min at 22°C. The secondary antibody used was Goat Anti-Rabbit IgG H&L (Alexa Fluor® 488) preadsorbed (ab150081) secondary antibody at 1/2000 dilution for 30 min at 22°C. A Rabbit IgG isotype control antibody (ab172730) was used at the same concentration and conditions as the primary antibody (HAP1 wildtype - black line, HAP1-MKI67 knockout - grey line). Unlabelled sample was also used as a control (this line is not shown for the purpose of simplicity). A representative image of cardiomyocytes stained with α-actinin (green), Ki-67 (red), and Hoescht (blue). 4% paraformaldehyde-fixed, Triton X-100 permeabilized rat cardiomyocytes were stained for Ki67 using ab16667 at 1/100 dilution in ICC/IF. ab16667 staining Ki67 (red) in transgenic mouse spinal cord tissue sections (depleted of oligodendrocytes) by Immunohistochemistry (PFA perfusion fixed frozen sections). Tissue samples were fixed by perfusion with paraformaldehyde, permeablized with 0.5% Triton X-100 and blocked with 10% serum for 1 hour at 25°C; antigen retrieval was by heat mediation in 10 mM citrate buffer, pH 6, for 20 minutes at 97°C in a water bath. The sample was incubated with primary antibody (1/300 in PBS + 0.1% Triton X-100 + 1% serum) at 25°C for 16 hours. 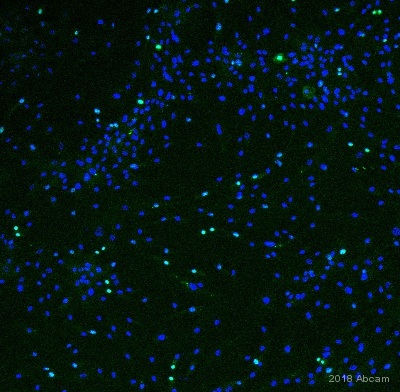 An Alexa Fluor® 594-conjugated donkey anti-rabbit IgG (H+L) polyclonal (1/700) was used as the secondary antibody. 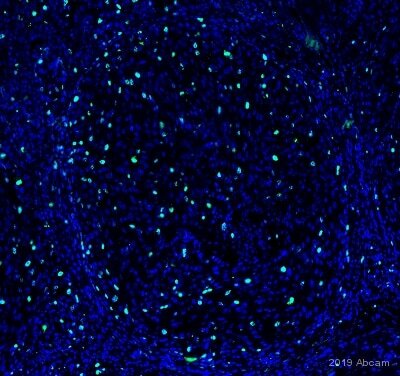 Counterstained with Iba1 (green) a marker for microglia and DAPI. Immunohistochemistry (Formalin/PFA-fixed paraffin-embedded sections) - Anti-Ki67 antibody [SP6] (ab16667)Image courtesy of Carl Hobbs, Kings College London, U.K.
ab16667 staining Ki67 in common marmoset spleen by immunohistochemistry (formalin/PFA-fixed paraffin-embedded sections). Tissue was fixed with formaldehyde and a heat mediated antigen retrieval step was performed using citrate buffer. Samples were then blocked with 1% BSA for 10 minutes at 21ºC followed by incubation with the primary antibody for 2 hours at 1/100. A biotin-conjugated goat anti-rabbit polyclonal was used as secondary antibody at a 1/250 dilution. Immunocytochemistry/ Immunofluorescence - Anti-Ki67 antibody [SP6] (ab16667)This image is courtesy of an anonymous abreview. 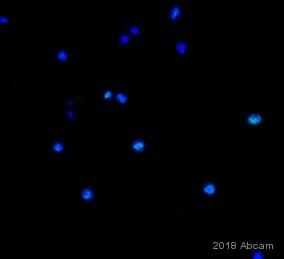 Immunocytochemistry/ Immunofluorescence analysis of human cardiac stem cells labeling Ki67 with ab16667 at 1/250 dilution. Cells were fixed in paraformaldehyde and permeabilized with Triton x-100, 0.01%. Cells were blocked in BSA for 1 hour at room temperature. 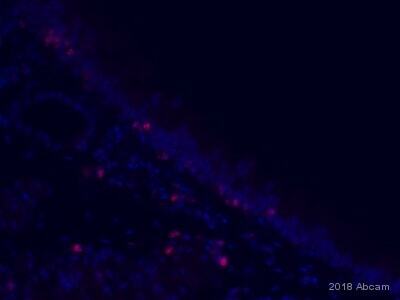 A polyclonal chicken anti-rabbit Alex Fluor® 488 secondary antibody was used at 1/500 dilution. 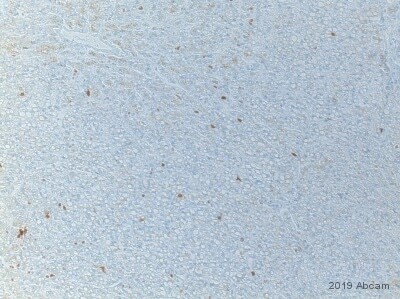 ab16667 staining Ki67 in rat liver tissue sections by immunohistochemistry (IHC-P - formaldehyde-fixed, paraffin-embedded sections). Tissue was fixed with formaldehyde and blocked with 1% BSA for 2 hours at 22°C. Samples were incubated with primary antibody (1/500 in PBS-T + 1% BSA) for 18 hours at 4°C. A biotin-conjugated goat anti-rabbit IgG monoclonal (1/2000) was used as the secondary antibody. Immunohistochemistry (Formalin/PFA-fixed paraffin-embedded sections) - Anti-Ki67 antibody [SP6] (ab16667)Image Courtesy of Carl Hobbs, King College London, U.K.
ab16667 staining Ki67 in human testis by Immunohistochemistry (Formalin/PFA-fixed paraffin-embedded sections). Tissue was fixed with formaldehyde and a heat mediated antigen retrieval step was performed using citrate buffer. Samples were then blocked with 1% BSA for 10 minutes at 21ºC followed by incubation with the primary antibody for 2 hours at 1/100. A biotin-conjugated goat anti-rabbit polyclonal was used as secondary antibody at a 1/250 dilution. ab16667 staining Ki67 in mouse embryonic skin tissue by Immunohistochemistry (Formalin/PFA-fixed paraffin-embedded sections). Tissue was fixed with formaldehyde and a heat mediated antigen retrieval step was performed using citrate buffer. Samples were then blocked with 1% BSA for 10 minutes at 21ºC followed by incubation with the primary antibody for 16 hours at 1/50. A biotin-conjugated goat anti-rabbit polyclonal was used as secondary antibody at a 1/250 dilution. ab16667 staining Ki67 in rat oesophagus by Immunohistochemistry (Formalin/PFA-fixed paraffin-embedded sections). Tissue was fixed with formaldehyde and a heat mediated antigen retrieval step was performed using citrate buffer. Samples were then blocked with 1% BSA for 10 minutes at 21ºC followed by incubation with the primary antibody for 30 minutes at 1/100. A biotin-conjugated goat anti-rabbit polyclonal was used as secondary antibody at a 1/250 dilution. Immunohistochemistry (Formalin/PFA-fixed paraffin-embedded sections) - Anti-Ki67 antibody [SP6] (ab16667)Image courtesy of Jing Ma by Abreview. ab16667 staining Ki67 in rat small intestine tissue by Immunohistochemistry (Formalin/PFA-fixed paraffin-embedded sections). Tissue was fixed with formaldehyde and a heat mediated antigen retrieval step was performed using 10 mM citrate buffer pH 6.0. Samples were then blocked with 10% serum for 20 minutes at room temperature followed by incubation with the undiluted primary antibody for 30 minutes. A biotin-conjugated goat anti-rabbit polyclonal was used as secondary antibody at a 1/2000 dilution. ab16667 staining Ki67 - Proliferation Marker in human HEp-2 cells by ICC/IF (Immunocytochemistry/immunofluorescence). Cells were fixed with paraformaldehyde and permeabilized with Triton X-100 0.25% in PBS. Samples were incubated with primary antibody (1/50 in DPBS) for 1 hour at 21°C. An Atto488-conjugated Donkey anti-rabbit polyclonal (1/50) was used as the secondary antibody. Publishing research using ab16667? Please let us know so that we can cite the reference in this datasheet.